Jonathan Cypher was atemporal, so when he found himself leaving the Eurythmics concert, he wasn’t sure where or when he was. Almost everyone around him was speaking German. There was a screenwriter talking about filming the group’s performance later in the year, a couple arguing about marriage, an aging academic expressing his opinion to his daughter about the industrial age and the role of the steam locomotive, and a misguided model disagreeing with a photographer about how women with rounded hips were not fashionable. One of the three men carrying large, heavy sacks into the apartment complex basement had a lopsided smile. They’d left a lookout near their van to watch the main road. Jonathan was observing them from what Raven called the world of many doors and windows. It was a realm in-between the quantum realities. He was a soul, one of many neshamot who had been released from time and space when he died, but had not yet returned to the Source. On his journey, he could go anywhere and anywhen and do anything. He stepped through a door that wasn’t there and when he seemed to materialize out of nowhere, the three men scattered, scrambling back up the stairs. Picking up the lookout, they jumped into their van and were gone. After that, it was a simple matter to call the local police who subsequently called the bomb squad. 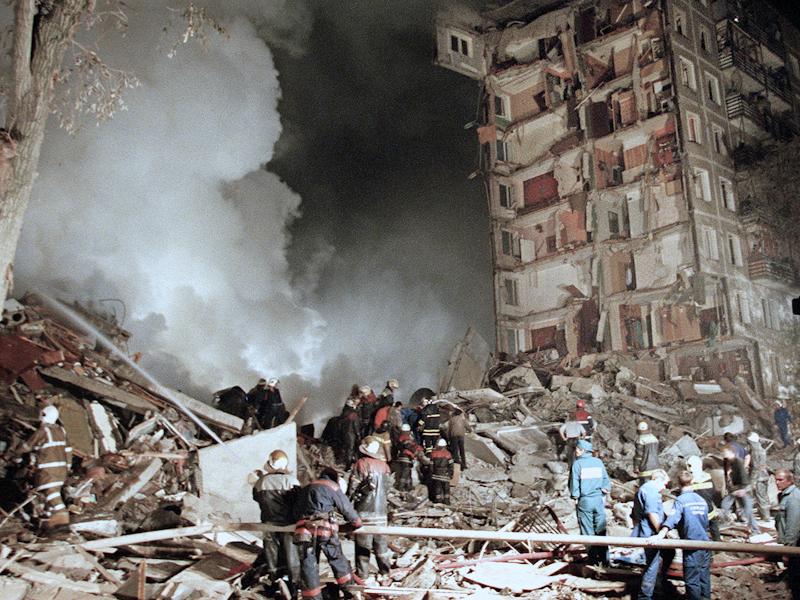 This was one of the Russian apartment bombings that had failed. Once more invisible and intangible, he looked up at the still whole structure. Inside one of the residences, an eight-year-old little girl would live and grow up to make a difference in the world. Twenty years from now, as a naturalized American citizen, she would be a voice for sanity in a world consumed by fear; a United States where terrified people were committing unspeakable acts of violence in the name of peace and resistance. She would live and attempt to bring healing to a polarized and discordant nation. I saw the word “Eurhythmic” and immediately thought of the musical group. The word “atemporal” immediately brought my character Jonathan Cypher to mind, and thus a time travel (of sorts) story was born. The Eurythmics did do a Peacetour as described above, and the Russian apartment bombings were an actual series of events, including the failed Ryazan incident on September 22, 1999. Good use of the word eurhythmic. Well done. It’s the first thing that popped into my head, Michael. Thanks. Oh, I like this – a positive, humanitarian spin to the classic tale of time-travel. I like Eurhythmics too. Nicely done! I like this one a lot.